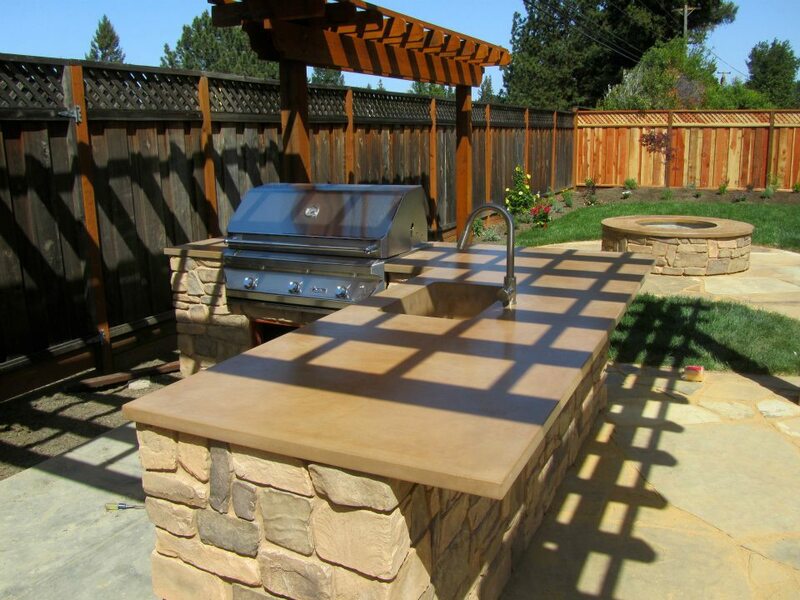 Outdoor Kitchens are a great place to showcase concrete's endless ability. 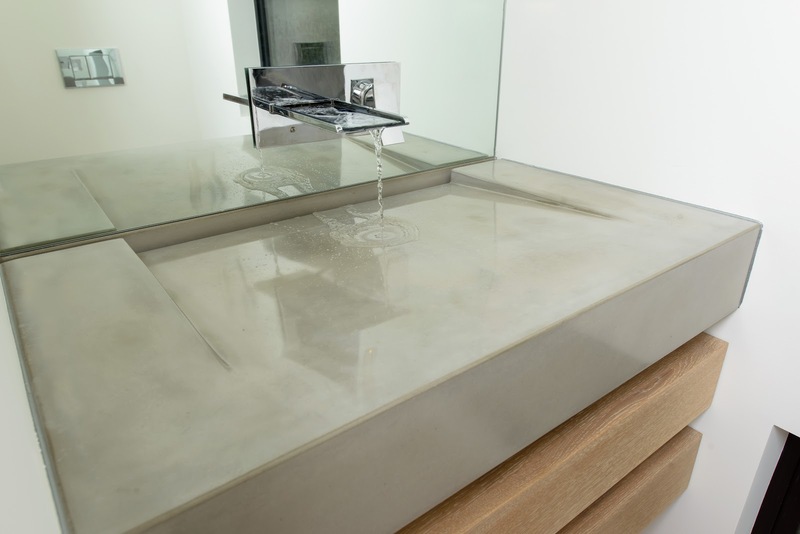 Client's routinely choose natural stone to create their private backyard oasis', why not add handcrafted concrete countertops to finish the space. The look, feel, and possibilities are indeed endless. I was hired to create a unique backyard living area for a beautiful home in Santa Clara ca. I was given a ballpark color to start with, light brown/tan. The very first color sample was the one that fit the bill. It is now called "salted carmel", after my favorite ice cream from Polar bear. Polar bear just happens to be 3 doors down from me in the industrial complex where my studio is located. If you have not had their ice cream, Then I highly recommend you check them out! Ok back to the subject at hand, concrete. This project was my largest up to this date, as well as the biggest piece I had ever cast. 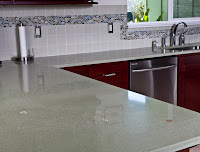 The main section of concrete is 10 feet long by nearly 4 feet wide with an integral 24 inch kitchen sink. 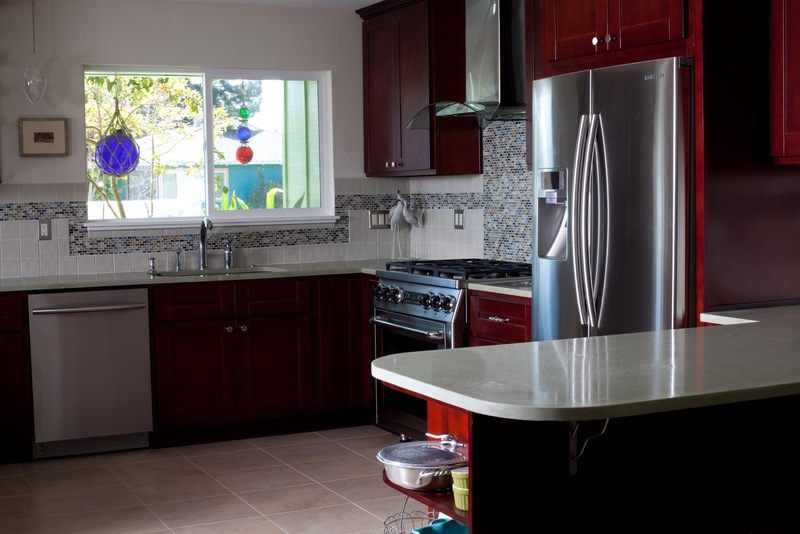 This piece overhung the back of the island 10 inches to accomodate friends and family. From there the counters turned 90 degrees and headed another 7 feet to make room for the stainless steel Bbq. What outdoor kitchen would be complete without the Bbq? To make this a one of a kind backyard sanctuary, the client requested an outdoor firepit. The contractor and I were happy to oblige. Created was a 6 foot diameter fire ring capped with a matching hand made 1 piece "salted carmel" concrete top. Plumbed with natural gas and equipped with an auto lighting mechanism, this fire ring really lit up the back yard! Perfect for roasting marshmallows or relaxing by the gentle flames, possibly enjoying your favorite beverage of choice. A matching concrete bench cap was created to sit atop a 17 foot long arched half wall. Finished in 2 pieces, this wall/bench framed out a beautiful garden area that is planted with annuals. Templating was slightly tricky without the stone facade being in place at time of the template. The stone was onsite and I was able to establish a nice overhang. The client wanted a real minimal overhang, just enough for water runoff. A little extra time was needed during install, but the resulting look was well worth it. A very sleek finish. dreams a reality! Swing by concretecraftsman.com for some more inspiration. I have recently come into a slow patch with my business. Which I attribute to non-marketing or basically doing nothing to promote my business. It has led me down the path to "shameless self promotion". I have spent countless hours in my shop perfecting the art of imperfect concrete. Not imperfect in the sense of "shoddy" work but more in the way of allowing concrete to be just that -concrete. Small pinholes and natural movement in the pieces are a desired effect. As well, concrete generates a beautiful patina over time and also shows signs of use. Along the lines of an old leather jacket or butcher block. 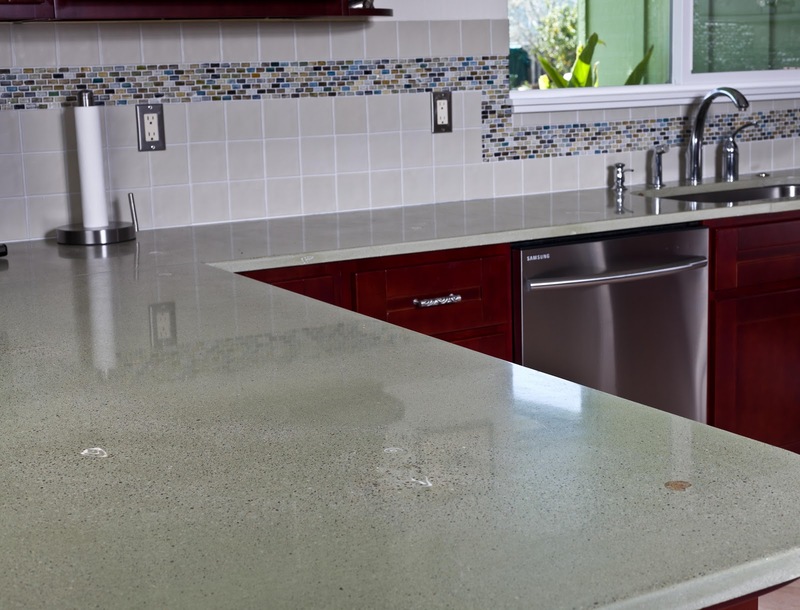 Not like a plastic countertop from everybody's favorite mega impersonal box chain store. I am a 4th generation craftsman and have a very good eye for detail. Details are what separate the men from the boys. But without any clients what does attention to detail get you? A wallet with moths in it and a bank account that is laughing at me! All this time in the shop has allowed me to embrace concrete and all its nuances, but it has not led to my phone ringing off the hook. I have managed to stay consistently busy for the last year and beyond with basic word of mouth. I am now making the switch to a more aggressive self promotion. My promotional postcards are in press, expected in 7 days. I plan on "attacking" the market like a caged animal let loose on architects, designers, and builders. In the next few weeks I will be bombarding all of the previously mentioned. I realize that I should have been doing this the whole time. I guess (actually I know) that I lack the confidence to sell myself. Well screw it, what do I have to lose? I don't have much work right now so the only thing to come will be more work I guess. Whats the worst they could say? NO! I can take that. I've been told no a lot in my life and i'm still alive and kicking. No worse for the wear either. So if you are an architect/designer in or around Santa Cruz ca, be on the lookout for a blond hair,blue eyed, mohawked and fully sleeved concrete designer knocking on your door. I mean business, and am taking no prisoners. A great friend of mine told me "you have to kiss a lot of frogs to find a prince". Well pucker up all you architects and designers cause I just put some chapstick on and I like tongue! I pose a question to the handful of readers of this, what do you recommend on attracting clients? I am young, hungry and looking to blow some socks off with my concrete! What has worked for you? I would love some feedback on what has worked and what has been a waste of time or money.